Buy Lanyards online, Visitor, Staff, Contractor and Security. 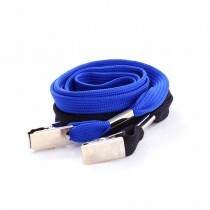 Lanyards, best value Australian lanyards online. InteractCard offer a wide range of lanyards and custom designed lanyards. You can buy online our Contractor, Security, Staff and Visitor lanyards or contact us for custom printed lanyards with your specific attachments and colour design requirements. Visitor, Security, Contractor & Staff Lanyards order online. Detachable Buckle, Safety Breakaway, Superior Swivel Clip. 10 per pack. 15mm Woven Polyester Cloth Lanyard. Prices are excluding freight and GST. A practical solution for the budget conscious, the 'Premium' range provides a wide variety of styles, attachments and colours. There's also a special "breakaway" safety feature available as an option that allows the lanyard to come apart if it becomes entangled. This is particularly useful in hazardous occupations. Contact us to enquire about custom printed lanyards. We can supply screen-printed lanyards with a variety of finishes. We ship from Melbourne to Sydney, Brisbane, Perth, Adelaide, Canberra and the rest of Australia.